Remember when consumers and schools had two computer choices: PCs and Macs? Both came with significant negatives. For PCs, it was computers that frequently crashed or froze. For Macs, is was price. Many schools now use the iPad for 1:1 classrooms. It still has a high cost and lacks a good keyboard. At last, a new solution is here. The Chromebook outdoes PCs for affordability while being sleek and stylish like a Mac. Like the Mac I had at a previous teaching job, my Chromebook performs very well and does not crash. My students and I are loving our Chromebooks. My district is using Chromebooks with eighth and ninth grade students this year as a pilot program. I am so fortunate two-thirds of my classes are with eighth and ninth grade. I hope the district makes the entire middle and high schools 1:1 with Chromebooks next school year. 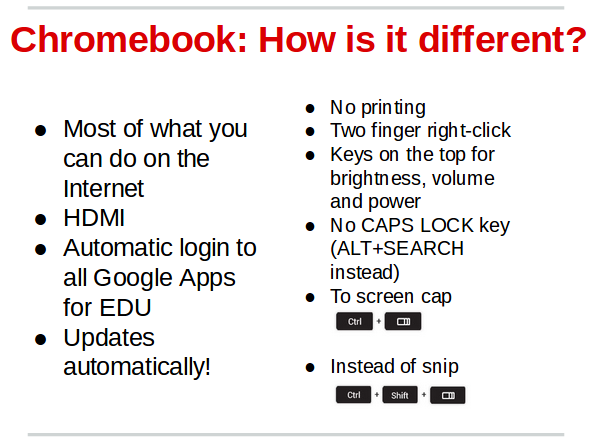 Here are two slides I have used to explain the unique features of Chromebooks to my colleagues. These are not the most beautiful slides; I used them to go over this topic quickly before a longer discussion on 1:1 classroom management. The quick boot-up time. Please, Google, do not change this. Please do not switch to Android. The Chrome OS has no applications save for the Chrome browser, a calculator, and a camera. I often have students close their Chromebooks for class discussion. Students are right back where they left off upon re-opening them. Automatic log-in to Google Apps for Education. Using a COW or a computer lab meant that students would boot up the computer, log in to the computer and then log in to Google Apps for Education. All this took some time. Chromebooks change this process to one essentially instant step. Once a student has logged in, they can click icons for GMail, Google Drive, Google Classroom and Google Calendar and arrive instantly. Great battery life. 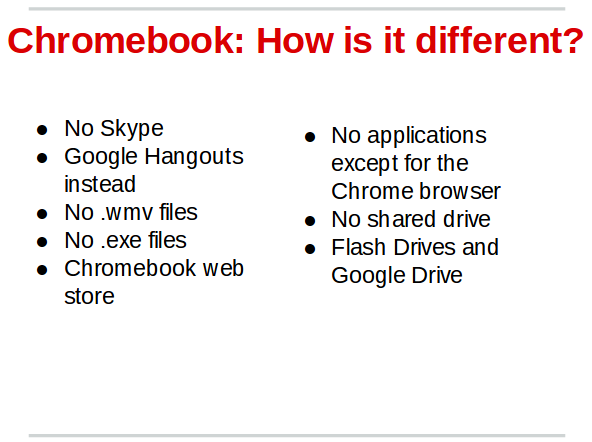 I have been using a school-issued HP Chromebook since July. During the summer I worked with it all day. By the end of the day there was a good deal of battery life remaining. This included a lot of use of video and music too. Students at my school leave their Chromebooks on chargers in their homerooms overnight. Battery life has not been an issue for them. The keyboard. My school-issued HP Chromebook has a nice keyboard. I much prefer my students use it than type on an iPad or an iPad add-on keyboard. The screen! My school-issued HP Chromebook has a beautiful wide HD screen. YouTube HD videos look stunning. As you can tell, I love the Chromebook. There is one concern I have with it: the touchpad. The touchpad requires two fingers next to each other to right click. I have been doing this since July and have not mastered it. I plug a mouse into the Chromebook to be as productive as possible. If you have students with motor issues, I highly recommend pairing mice with their Chromebooks. The Chromebook touchpad is also very sensitive. When they started using Chromebooks in the classroom, some of my students would inadvertently click “submit” on Google Forms I used for assessment when they did not mean to. My work-around for that has been to make every question in my forms a required question. Set each Google Form question to required so sensitive touchpads won’t be a problem. That issue aside, Chromebooks are the ideal solution for 1:1 classrooms. They are more affordable than iPads and PCs without the crashes and clunky-ness of PCs. They are cheaper than iPads with a better keyboard and seamless integration with Google Apps for Education. The Chromebook is an efficient, powerful machine. I have a feeling it will become a big part of education, personal and business computing in the next few years.